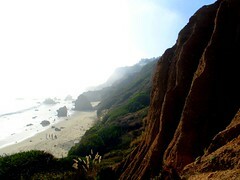 One of my favorite Southern California beaches is El Matador Beach in Malibu. It’s a pretty empty beach, at the bottom of a cliff north of Zuma – filled with caves and “sea stacks”. It had been a few years since I had last been there, so I headed over there on Saturday to check it out. Although the weather oscillated between sunny and foggy(and the water was free-zing! ), I enjoyed the spot, and managed to put together a set of photos, as you might expect. Another funny phenomenon: impatient drivers who constantly switch lanes, hoping to get in the fast lane. This mostly happens on streets with two lanes(like Melrose, Sunset or Fairfax let’s say), here in Los Angeles, but I am sure it’s not an exclusively Angeleno idea. It can happen anywhere. These drivers never seem to get where they are going any faster. They don’t understand that lane speeds vary so greatly, so you might as well stay in the one you are in, even if it seems slower at the time – it will probably speed up in the next minute or so. I find myself passing them more often than I do the other drivers who just chill and don’t try to weave. They are pretty funny to watch, especially when you pull up alongside these guys(a large percentage of them tend to drive superficially souped up imports(sorry, loud muffler does not add horsepower…)) at the next light. But then again it’s not so funny when you begin to suspect that this gratuitous lane-shifting may be a major contributor to traffic. I guess it’s the principle of anti-Slack in action. On Saturday afternoon I decided to take a quick drive through the industrial City of Vernon(their motto is, in fact, “Exclusively Industrial”), California to check out some of the facilities. The place is excusively industrial. Nobody lives in Vernon and everything there is measured in tons and made of steel. Key point: the Farmer John’s murals created in 1957, by Les Grimes and entitled “Hog Heaven”. These are worth a looksee. Park in the adjacent McDonald’s and then walk on over to the Farmer John’s processing plant to check them out. Lots going on there involving pigs and those who love them. Saturday’s turn of events took us over to the Huntington Library and Botanical Gardens in San Marino, CA. Over 150 acres of amazing plant life divided into multiple areas: desert garden, tropical garden, japanese garden and more, which we did not visit this time. Why? Because it was hot and shade is not exactly abundant here – that’s not a complaint, just a fact of reality that we should have come better prepared so as not to get very hot as we walked around. But the place itself is great, and worth visiting(I had been meaning to go for years, and finally got around to it) and for those of you who do go on a hot day there is a drink cart located conveniently near the exit. This entry was posted on Sunday, July 3rd, 2005 at 3:18 pm and is filed under Outdoors, Los Angeles, California. You can follow any responses to this entry through the RSS 2.0 feed. You can leave a response, or trackback from your own site. Right where Santa Monica Blvd meets Sunset(next to the Jiffy Lube), there is a building on the right hand side that is painted with the words: “Silverlake’s Own World Famous Five Dollar Guy”. Not a bad mural, in and of itself, but I am not entirely sure what it all means, and I was hoping that someone out there could venture an idea or opinion so that we can all get to the bottom of this – together. Besides being aware of the mural’s existence, I saw who was painting it: a gentleman wearing cutoff shorts and a pink bandana – no shirt, didn’t see what kind of shoes. We had seen this guy maybe a week or two prior, at the same location(before the mural actually existed) holding a sign saying: “$20.00″. He was standing next to a white dresser, so I initially I assumed he was trying to sell it to make rent or something. But maybe I am just being naive. Perhaps it was just coincidence that the dresser was there. In any case, that sign seems incongruous with the “Five Dollar Guy” proclamation, but what do I know really? It’s just an interesting situation that I was hoping to shed some light on and at least document what I know. Last night while driving to the Burbank Fry’s and a few other establishments in that area a thought encroached on my normally placid demeanor: is it just me or do people here drive extra-crappily? I’m talking about drivers who actively block you from entering lanes into which you are signalling, little people driving big SUVs and can’t seem to gain full situational awareness, people rolling through stop signs at crowded four way intersections, etc. I don’t know if statistically these behaviors lead to more accidents per se, but I would hazard to guess that they lead to more stress for all users of the city’s byways. I am more used to the Central LA style of relaxed driving where people work to create a nice flow of traffic and then go with it. No weaving in and out of lanes trying to get into the faster one and then ending up at the same stop light, no high pressure occupants screaming inside their shell because they can’t exit gracefully from their miscalculations. At least most of the time. I feel worn out when driving in places like West LA and Burbank – I definitely have to drive more defensively than anywhere else I go. Some people I have talked to seem to notice a correlation between higher rent areas and shittier driving – perhaps its because more people there have fully paid insurance on cars that they don’t own(read:lease) so they really have nothing to lose by driving like they own the road, or maybe the issue goes deeper. Back to that sense of entitlement that tells them that the shinier object has the right of way.